Located in a prime location for exploring the many sights and attractions of San Francisco, Holiday Inn Fisherman’s Wharf is perfectly suited to families who want to really make the most of their time here. Facing the waterfront, just a short distance from Ghirardelli Square, Pier 39 and the Golden Gate Bridge, you’ll be in a great position for experiencing all this city has to offer. A convenient and welcoming hotel, the rooms and suites here are well equipped for a relaxed and comfortable stay. There is a 24 hour on-site restaurants which offer a range of American favourites, as well as multiple dining and cocktail lounge options, just outside the hotels doors. 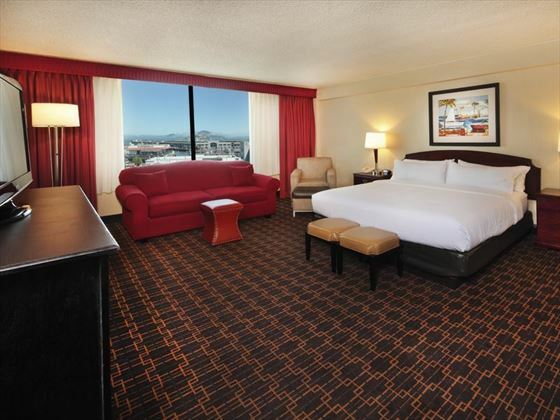 Located at Fisherman’s Wharf, just a short walk from the shops and restaurants, this hotel is within easy reach of the cable car station for exploring in classic San Franciscan style and close to the famous Ghirardelli Square and Pier 39. Denny’s Restaurant offers a varied traditional American menu 24 hours a day. Java Express features Starbucks coffee and coffee drinks along with Mrs. Field’s baked goods.